Why have you made this site? Or... I just love caffs. 'Caff' sounds rude and I'm offended - what should I do? Please, please don't be offended! If you know how much I love caffs, and greasy ones in particular, then you would realise what an esteemed accolade it is. You're a unique feature in today's cloned high-street and for me this is why you stand out. Hope that makes it better! How do I know if I'm in a caff? For me it's the food. Big ol' hearty fried fare. A caff will have its fryers set to stun, blazing 24/7, like a relentless frying machine. Chips and the frying of such should not be upon request. They should be the foundation of most of the meals, and a refusal of such will be met with a reaction like saying 'soy vegetariano' in Spain. All-day-breakfasts. Not breakfast-until-11:30-and-from-11:00-we'll-begrudgingly-serve-you-what's-been-left-out-since-then. This is the best meal the nation has, let's not hide it when the tourists land at lunch-time. 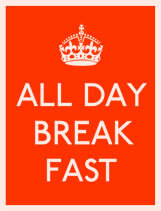 Our clever caff serves its breakfasts all day. Hot drinks should be clear cut: tea or coffee. Shilly-shallying with frappucinos, hazelnut syrup and - Goodness Save Us - soya can only cause an identity crisis. 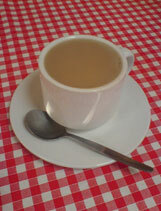 Hot drink options, other than tea or coffee should be: milk or sugar. And when your drink arrives there should be a degree of difficulty in distinguishing which it is from its hue. NB: this does not include Bovril or Ovaltine. Asking about 'WiFi' should get you thrown-out and your Birkenstocks set fire to on the doorstep. Of course these are just guidelines - as long as the caff you are in has a generous helping of the above [and you're tucking in to a fried belly-buster right now] then you can rest assured that you're in the right place. You probably can't see where you are as focus naturally goes from one's eyes to one's fodder. Why should I patronise a caff? Well if you want imperial sized, watered down, coffee off-cuts and food that they can only heat with an iron, then you carry on down to Costabucks - go on. It already possesses the strangling hold of a Russian Vine and should not be fed. My caff is sacred and I don't want it exposed - what should I do? 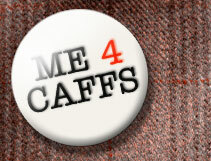 I have added the caffs locations to give them an upper hand in such difficult times. However, I understand that to some their local caff is sacred and placing it on a map breaks strict, unwritten rules. So we have respectfully added an option to give the caff 'hidden gem' status. To 'request a hiding', please provide us with an email, the caff in question and a cryptic clue for locating it otherwise. That way your caff will be safe from an invasion of hair-waxed twonks who don't really care. Are you a hair-waxed twonk? If there's a strong wind up, yes. I will apply a product to add weight and counteract flyaway hair. 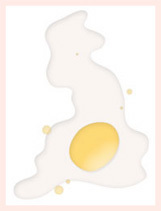 Have you had a cholesterol test of late?